As a proud homeowner, you want the design of your home to showcase your individual style—and it should. Considering that your home’s exterior is what people see first, it makes a lot of sense to display your own stylistic preferences in a way that is appealing. And it’s also smart to make style and color selections that match current market trends should you decide to sell your house. Whether you expect to be putting your home on the market soon, or whether you plan to keep it in the family a long time, a home exterior that pops with color, looks attractive, and is easy to maintain is something you deserve to enjoy as a homeowner. But just what should you choose to enhance your home’s curb appeal in a way that fits today’s modern styles? 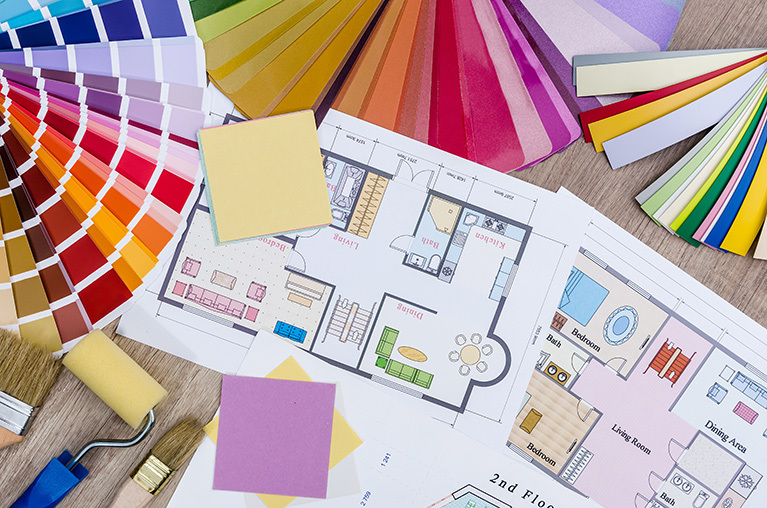 Let’s take a closer look at some of the new colors, new blends of texture and style, as well as 2018’s trendy combinations of natural elements that are turning the heads of excited realtors and their clients. Upgrading your home’s exterior with fresh, vibrant colors is a simple, effective way to increase the value of your home. And of course, a professional paint job looks appealing, attracting buyers who appreciate a house with strong curb appeal. Even if you don’t plan to sell your home anytime soon, giving your home a face-lift with gorgeous colors will keep your house looking great for a long time. This year, grays and darker colors with white trim, along with contrasting bold and bright front doors in solid colors, make your home’s exterior stand out from the crowd. Also, multiple shades of the same color can create an appealing sense of contrast that sets your home’s facade apart, making it the star of your neighborhood. Two-toned siding has been around for a while, and it is definitely a favorite choice for many homeowners. But in 2018, the trend has become more popular than ever. Today’s modern homeowners are redesigning their home’s exterior not only with two or more shades of colored siding, but also with more than one style at the same time. Much like the classic style of contrasting brick and stone, the combination of multiple styles and textures of siding produces a unique look that is not only daring, but more importantly, inspiring. Like any other total home exterior makeover, a truly contrasted look takes commitment, but the stunningly bold look will create strong curb appeal that many homeowners love. If you’re a homeowner who prefers an understated, natural approach to decorating, you’re in luck this year. Taking an authentic, natural approach to your home’s exterior appearance is making quite a resurgence lately. Timber with a natural or lightly-stained finish is definitely in right now. It’s a look that hearkens back to a simpler time, but it also lends your home the strong, classic, traditional curb appeal that is always attractive to those who are shopping for a new home. Organic elements tied to the house and its surrounding landscape are trendy and eco-friendly. And the natural look creates a soothing, peaceful feel that buyers are drawn to. From elegant cedar posts on the front porch, to board and batten shutters along the windows of your house’s front exterior, the natural style is one of the most appealing designs that home buyers are looking for. As you plan for your home exterior upgrades to enhance your home’s look and feel, keep in mind that every year is slightly different than the year before when it comes to trends. You may want to be really trendy if it fits your personal style or if you are selling your home in a trendy neighborhood. But you may also prefer to consider a more classic approach. If this is the year you give your home’s exterior the TLC it’s been needing, John McCarter Construction can help. Contact or call John McCarter Construction at (248) 446-1750, the Elite Preferred Contractor for James Hardie siding, for a free siding estimate. We’ll guide you through the process of choosing the right colors and styles to fit your unique needs, do the upgrades right, and have you loving your home’s look and feel again.